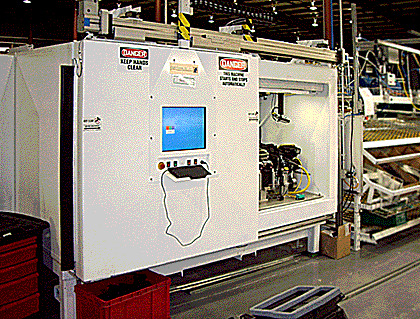 Beach Dynamics designs laboratory and production line test cells to meet the toughest specifications. 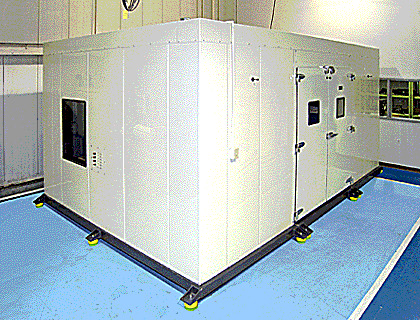 The powder coated test cell shown at left sits on a vibration isolation floor to eliminate tractor trailer and fork truck vibration and noise resulting in a 48 dB reduction at the critical 1 kHz frequency for this laboratory test cell. Floor supports point loads in excess of 1500 Lbs. Test cell features a view window, instrumentation bulkhead connectors, HVAC with remotely mounted compressor, and large double doors. 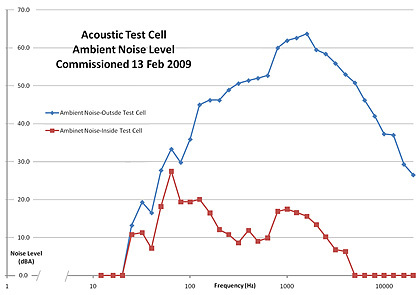 This graph measures the noise reduction of above shown booth. Greater noise reductions are available for more demanding customer specifications. ... with sliding door and all controls.